...we saw two good bulls and we both tried a shot. Jim sealed the deal while my bull disappeared into the valley. 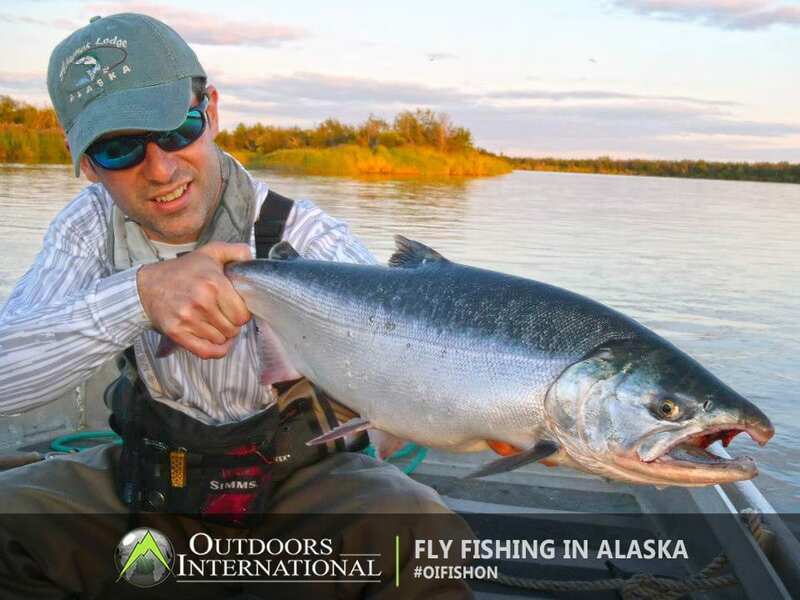 Will you book another trip with Outdoors International in the future? Yes, we requested some info on a bear hunt . 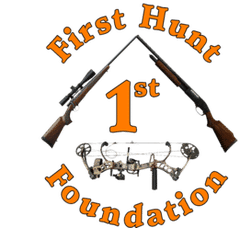 Because I trust that Russ has do these hunt and that he will recommend only good hunts to his clients. After a long day of travel we arrived in Kotzebue, AK where we were meet by our outfitter. We drove around Kotzebue he showed us the site which consisted of a lot of shed type house covered with caribou and moose antlers and the town liquor store. Not much else to see there. We went to breakfast and waited for the skies to clear so we could fly in to the bush to start our caribou hunt. The fog finally cleared around noon so we loaded our gear into two small planes and flew into the bush. We flew about 70 out of town and saw moose, caribou and wolves on the way. We landed on a gravel bar surrounded by willow thickets on one side and pine forest on the other. We were excited as hell to get setup and go look around. All of the gear that was provided by the outfitter was quick and easy to set up. The first day in the field was discouraging the river bottom we setup in was thick with pine forest bogs and willow. We could not do much glassing from near camp and found out it would be an hour hike out of camp to see anything we did however see our first grizzly. The second day first day hunting we headed for the closest high ridge we could glass from. (about a two hour hike). From the top we started seeing caribou far away but all over. Soon after we spotted a heard about 1,000 yards out with two shooter bulls in it. We decided to walk straight at them to get in range for a shot. This was a bad idea they spotted us at 900 yards and ran away. We setup glassing again and spotted a heard coming over a ridge behind us following the same track as the heard we spooked. We setup for a shot but they never stopped . We decided to move closer to the saddle they were crossing through. We sat near the saddle watching caribou and a grizzly bear far away until just before dark we walked up the ridge to see if anything was coming before dark and there was a small heard coming about 200 yards out. Just our luck no shooters just cows and small bulls. The third day we hiked back to the same spot. We glassed all day again seeing tons of caribou far away and 4 grizzly bears. The weather started to change and we were getting ready to head down when it started snowing HARD. We went over the ridge to check one last time for anything coming. Before we made it to the top we saw a big herd coming through the saddle 250 yards away. We both dropped to the bipods . 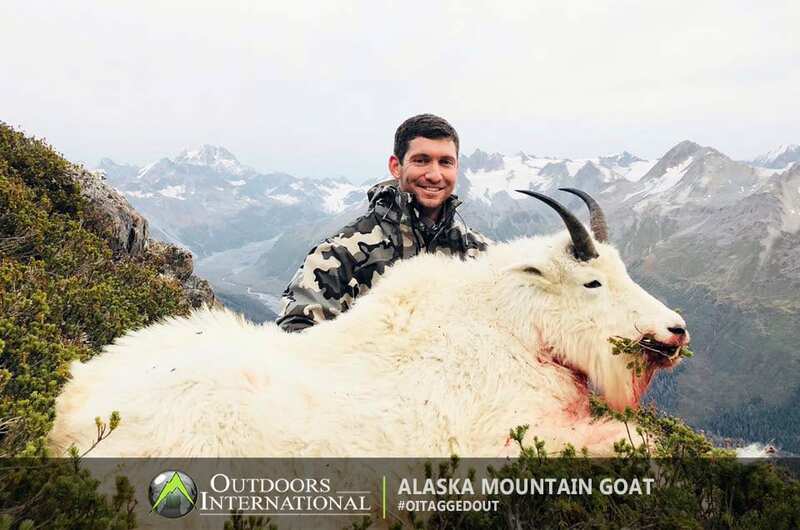 We were impatiently waiting searching for shooter bulls when we finally saw two good bulls I shoot at the first bull and mist Jim shoot at the second bull and stopped it in its track he took one more shot to seal the deal while my bull disappeared into the valley. The snow was still falling heavy and by the time we picked up our gear and walked the 250 yards the bull was already covered in snow. We caped and butchered him and packed out all four quarters. The fourth day sunny and snowy we hiked back up to the saddle I sat and glassed while Jim started packing meat closer to camp. It seemed like the great caribou migration was over. I saw only one small bear far away high on a ridge nose to the ground heading south, five wolves following about an hour behind and 2 grizzlies looking for a place to hibernate. We loaded the remainder of meat, cape, head, and horn on our packs and headed down. The fifth day we hiked up again hoping for some movement because it nice and sunny but we sat and glassed all day and saw nothing except bears and moose. Day six we woke up to rain and wind so we decided to set up our tarps and spend the time fleshing and salting the cape. about the time we were finished the rain slowed enough to go hunting. We explored up and down river for good crossing areas with fresh tracks but 2 hours up and 2 hours down we found none. The last day light fog delayed our flight out a few hours but we stayed around camp praying for a caribou to come down the gravel bar but again saw nothing. Jim shot a great bull I missed my only opportunity but learned a lot and can’t wait to go back.